We are retrieving your information. Your information is being submitted. Please answer all questions to verify your identity. You can then retrieve your credit data safely and securely. 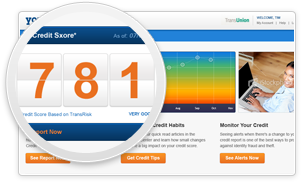 You qualify for a FREE Credit Score! Sign up for a 7 day trial of our Triple 3-in-1 Credit Plan. A refundable $1.00 processing fee will apply. CCV #: what is this? Pricing Information: By submitting your secure order you will be charged a $1.00 one-time processing fee and receive your Credit Score, Credit Report and a 7 day trial of credit alerts and ID theft protection. To avoid any additional charges, simply cancel during the trial period and no further charges will ever apply (remember to ask for your $1.00 processing fee refund). For continued protection and new, updated scores and reports, do nothing and your service will automatically continue for just $29.94 per month after the trial period. You may cancel the service at any time to stop all monthly billing, via our toll-free telephone line at (888) 387-0890. Before you can receive your credit score, credit report and credit alerts, you will be required to answer identity verification questions. Only ID theft protection service shall be provisioned until you answer identity verification questions correctly and completely. Your monthly fee will apply whether or not you have completed the identity verification questions. See what the lenders see and make sure your credit report is up to date! Check your credit report for inaccuracies due to identity theft, divorce or just having a common name e.g. John Brown. We'll tell you how to dispute these inaccuracies and clean up your report. Triple 3-in-1 Credit Plan also includes your 3-in-1 Credit Report and a subscription to 3-in-1 instant Credit Alerts and non-stop ID Theft Protection. Our best value plan!